Woburn, MA, August 1, 2012—Innovations in Optics, Inc. introduces a new product line; LumiBright™ BD Boards for high power LED applications. Offering maximized heat and current spreading, metal core LumiBright BD Boards are engineered to deliver high output optical power, large emitting area, superior thermal management, and open platform flexibility that provides for totally unique and compact LED design solutions. The use of LEDs for high brightness applications has been enabled by the recent efficiency improvements from commercially available LED die. However, most die are sold for use as packaged LEDs which can impose design limitations for many potential LED applications. A packaged LED has convenient wire leads or solder pads for PCB mounting. However, most also include an optical lens, reflector or resin to encapsulate the LED die for protection which severely handicap optical system design optimization. Light sources built using packaged LEDs do not provide sufficient emitting area, output uniformity, or power for the most demanding technical applications. Most LED die sizes are kept small to reduce photon losses from total internal reflection (TIR). Commercial “large-chip” LEDs using photonic lattice technology reduce TIR losses and increase light extraction. However, large-chip LEDs are rectangular as convenient for primary use in visible projector systems that produce four-sided images. Optical systems that require a circular aperture will have to “waste” a portion of the chip emission. Furthermore, large-chip LEDs are only available in three primary colors (red, green and blue) or white. 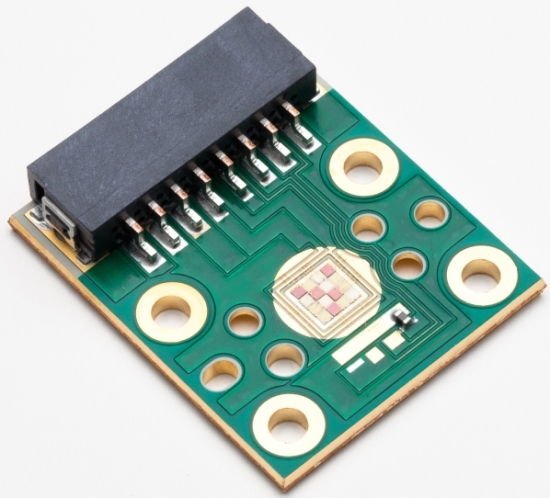 Small chip arrays can be sized for efficient coupling into round apertures and multiple wavelength arrays can be collected and mixed by a single primary optic. LumiBright BD Boards utilize chip-on-board LED technology with metallic core PCB substrates that feature a large emitting area from a closely packed array of standard LED chips. The number, size and arrangement of chips in the array can be set to fill the entrance aperture of non-imaging concentrators, light pipes, and fiber optics mounted in close proximity for maximum light collection, and for producing round or rectangular illumination patterns or exit apertures for relay by secondary optics. LumiBright BD Boards can be populated as multi-die arrays in single, three, and sixteen color LED as user specified combinations from our standard selection of 26 die offering wavelength choices spanning the ultraviolet to the near-infrared as well as broadband white. The product line offers multiple and customizable configurations and small footprint to facilitate integration into OEM illuminators and light sources. The optimized thermal management in LumiBright BD Boards supports more than 50,000 hours of continuous operation as high brightness solid-state lighting by exploiting the efficacy and characteristically long life of the most powerful LED chips under high power drive conditions. An on-board thermistor and optional photosensor permit real-time monitoring of temperature and light intensity for closed-loop control. Surface mount cable connectors are standard fixtures or soldered wire leads can be supplied upon request. LumiBright BD Board accessories include thermal management devices, wire harnesses, and driver/controllers. Innovations in Optics, Inc. (IOI), founded in 1993 and located near Boston, is widely recognized as a leading innovator in the areas of high brightness LED chip-on-board (COB) products and illumination engineering and technology. Leveraging a unique, multidisciplinary approach to systems design, the company pushes the technology envelope to develop industry-leading ultra-high brightness LED products. IOI light engines and illumination systems feature patented and patent-pending optics which collect, direct and maximize output efficiency and uniformity, enabling some of today’s most revolutionary solutions in cutting-edge technical applications for LED light sources.